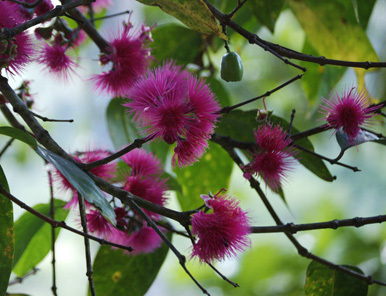 Syzygium malaccense, "Malay Apple" (Myrtaceae). From PROTO OCEANIC *kapika, Syzygium malaccense, "Malay apple" (Myrtaceae). Maori: Kahika, Kahikatea (Dacryocarpus dacrydioides [Podocarpaceae]), Kahika, flower of the rātā (Metrosideros robusta [Myrtaceae]), Kahikahika (M. fulgens), Kahikaatoa (Leptospermum scoparium [Myrtaceae]& Kahikawaka (Libocedrus plumosa [Cupressaceae] . It seems as if this name was originally applied exclusively to the "Malay apple, or "Mountain apple" (illustrated on the left), a tree grown throughout Southeast Asia (and related to the New Zealand maire). It was carried throughout Polynesia and established in places like Hawaii which it did not grow natively. However, only the name was carried to Aotearoa. 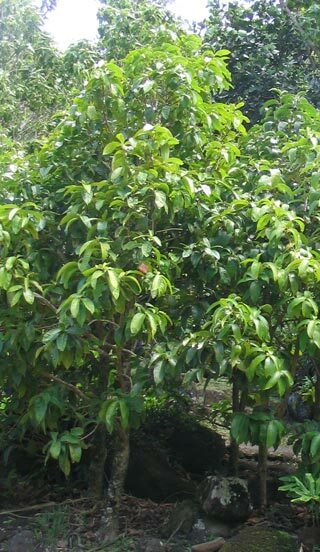 The original "*kafika" is a multipurpose tree, growing to about 20 metres high, with an edible fruit, and a strong timber which can be used for construction, and which was also one of the woods used in Hawaii for carving religious images. An infusion of the bark is used in many parts of the Austronesian world for treating skin conditions (and, in Hawaii at least, sore throats), and the root also has medicinal properties. Both the word and its meaning have ungergone some interesting transformations in Polynesia, as can be seen from the list of reflexes opposite. There is a very interesting convergence between Hawaiian and Maori, with the application of a variant of the name to species of rātā (Metrosideros) -- not difficult to explain when you compare the Syzygium flowers with those of the Metrosideros species. The kahikaatoa "warrior kahika" is related botanically to the Szygium (they belong to the myrtle family, Myrtaceae) -- its fruits are certainly not edible, but the unopened buds (as well as the durable timber) are reminiscent of the Kahikaatoa, and the flowers are most certainly reminiscent of the rātā and Pōhutukawa, which also belong to the Myrtaceae. How the kahikatea ("white kahika") fits into this equation is slightly more problematic, yet it has also inherited the name without any qualifications, so a link must be there! My guess is that it would be the slim, straight trunk which would have attracted instant attention, and probably merited the name when the Polynesian Syzygium was nowhere to be found.The small orange berries festooning the tree in summer, although quite different in form, might have reinforced the allusion. The same considerations, graceful, symmetrical form form (especially in young trees), general usefulness and brightly coloured berries, would explain the incorporation of the word in one of the names of the New Zealand cedar, kahikawaka. 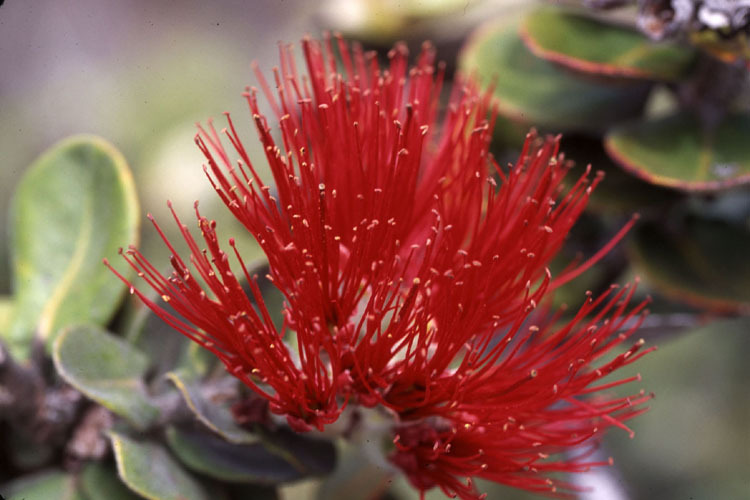 [Metrosideros polymorpha ('Ōhia lehua) flower. Further information : There is a good description of this tree and its distribution in The Lexicon of Proto Oceanic Volume 3 (See Bibliography).